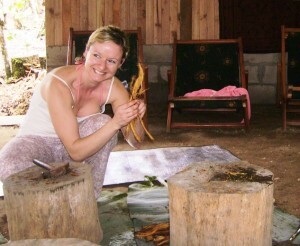 I have already mentioned my experience with Ayahuasca and I would love to tell you more about my trip to Ecuador, South America in March 2012 as it has had a huge impact on my life journey. I believe and am convinced that Ayahuasca retreat was the beginning of my raw food journey and more importantly self-love! Firstly, let me introduce Ayahuasca to those who have never heard about it. Ayahuasca (iowaska, yage, or natem) is a traditional healing plant brew used for millennia by countless generations of indigenous shamans of the Amazon in sacred ceremonies. It is a powerful tool for self-discovery and holistic healing. Ayahuasca helps to release no useful patterns, gain positive energy and attract luck. It allows individuals to connect with their inner healers – their real selves – and obtain important guidance. By going though the uneasy process of purification, one becomes empowered, centred and firmly positioned on one’s own path of a heart. Sharing this positive healing energy with others helps to heal the collective mind, which ultimately heals the Mother Earth. This vine is also called ‘Maestra Ayahuasca’ or ‘vine of death’ as you may have a ‘closer to death’ experience. It might sound scary and you may read many ‘scary’ stories about ‘Ayahuasca tourism’. Media is a powerful source of destroying information. One should try it himself before judging or providing misleading information to public. Anyway, back to my life-changing trip. I attended a retreat which was led by my friends who are both shamans and have been living in Ecuador for many years now. They have been recommended to me by Michal as he experienced this retreat in 2010. If you ever decide for Ayauhuasca retreat I would highly recommend visiting and working with a shaman who is trustworthy and was recommended to you by somebody you know quite well!!!! The Ayahuasca retreat took place in Amazon forest, in a ‘House of Dreams’ which is an Eco lodge located in the midst of a primary forest, build above a water canyon with crystalline water for bathing. The place was very quiet and allowed me to rest and focus on nature and our work with the plants. I took two of my dear girlfriends with me as they were very interested and I was happy that I don’t have to travel on my own. We spent 12 days in this beautiful place and experienced four ceremonies with Ayauasca and one ceremony with Tobacco – another very powerful plant and Teacher. To get the full medicinal effect of the Ayahuasca retreat, it was recommended to eat lightly during the 3 days prior to the ceremony . During our stay, we were on a special diet without meat, sugar, fat and spices and had to minimize sexual energies 2 weeks before our trip, during our stay and one week after our return. Any medicaments were strictly prohibited, including contraceptive pills. On the day of the ceremony, we ate only a light breakfast and light lunch. We normally had a light oatmeal breakfast and then a few pieces of fruit or fresh fruit juice for lunch, and then fasted for the rest of the day. All four ceremonies were magical for me! Before we started with our ceremonies we were asked to write five questions we have about our lives and which we would like to ask Ayahuasca to be answered. We wrote them on a piece of paper and put under soil where one of the Ayahuasca vines grew. Then after a beautiful sunset, the first ceremony began. I had to force myself to drink this special ’shot’ as it was very bitter. You can feel the taste in your mouth and stomach long after you drink it although you can take a bit of ginger to neutralize the taste. I went through different stages and Ayahuasca came to me in several energetic waves. I welcomed her with all my trust and respect! I will not describe each ceremony here as teh article would be too long. I’ll try and describe the feelings and visions I had. My body was clearing physically as well as emotionally. I cried, laughed, felt sorry for myself and forgave myself..this was important.. the forgiveness..and my journey of self love has begun. All your fears, traumas even unconscious ones may come up and heal. You may ask questions and find answers within yourself. The plant will help you with anything if you let ‘the entity’ as I call it and you just ‘let go’. It might be scary, you may vomit, you may have scary visions, you have limited control over your body..but if you let go and trust then you may have a life changing experience. I met entities from different ‘Worlds’ and dimensions. The most powerful experience I had there was when the entity allowed me to feel the unity.. that great feeling that we are all one. It showed me what unconditional love mean and invited me ‘home’ although I had no idea what it meant.. I was so scared! It even showed me where our souls go after we leave our physical bodies..this amazing place we all come from and is our true ‘home’ cannot be explained by words.. you must feel it, see by yourself..our real ’home’ is full of love, piece, calm, understanding and LIGHT! I realized we are all guests here on Earth, we chose to be here for a reason and we have to work hard on ourselves to heal our karma and become a light again. As you can see, it is a very personal and individual journey. Everyone has a different story to share. What was the outcome from my Ayahuasca retreat? 1. I realized and learned not to judge people and their actions. If I want to help somebody, I should accept him as he is and not trying to change him! 2. I will never forget the feeling of unconditional love! This is the true love you can feel to your kids. Can you imagine that you feel the SAME love to everyone and everything? That would be just awesome! I’m learning every day about this..
3. Te only thing I owned that time was a flat in the Czech Republic which I tried to sell for many years. After this trip, I sold this unwanted flat in a month! 5. I learned and still learning to ‘Let Go’! If you are a mother you will understand exactly what I mean. 6. I have much better and healthier relationship with my mum..very personal thing..
7. I become highly raw and I love myself! 8. I am much more sensitive to others and their needs and energies. I wish anyone could experience this…and I’m so grateful to Honza, Zuzanka and their team for this amazing retreat! THANK YOU, THANK YOU, THANK YOU! You can read about Michael’s experience with Ayahusca here.